On Thursday morning 24 July, Miles Wheeler gave a talk on “The Froude number and solitary waves with vorticity“. The waves are gravity waves, without surface tension, but with arbitrary vorticity determined by u(x,y)=U(y) with U(y)<c. The solitary waves are biasymptotic to a shear flow at infinity. The Froude number and its generalizations played a central part in the first half of the talk. Bounds on the Froude number for irrotational waves were reviewed, a new definition of Froude number for waves with vortiticity was introduced, and lower and upper bounds on this new Froude number for large amplitude waves were proved. A preprint on the Froude number is available here. 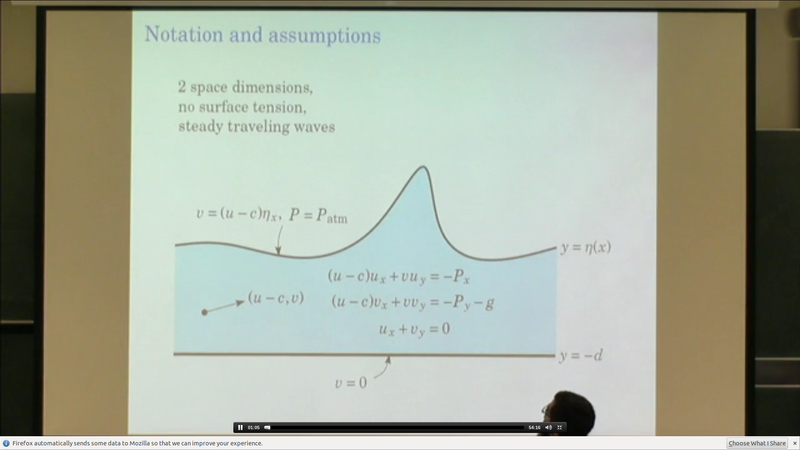 The second part of the talk was on existence of large amplitude waves with vorticity. First, numerical results in the literature, such as Vanden-broeck (1994) were reviewed, showing that overhanging waves are possible when vorticity is present. With an additional assumption on the shear flow, methods from global bifurcation theory, were used to prove that global branches of solitary waves exist in the Froude number amplitude space. A paper on the global existence was recently published by SIAM and can be found here. A video of the talk is available here.